It’s sometimes tough to get a picture of the wider world of games on a PC-only site, so here’s all the stuff that’s going on in Halo everywhere but here. The Xbox One is getting the Master Chief Collection next month, and the Halo 5 beta by Christmas. Even tellies are getting Halo Nightfall. 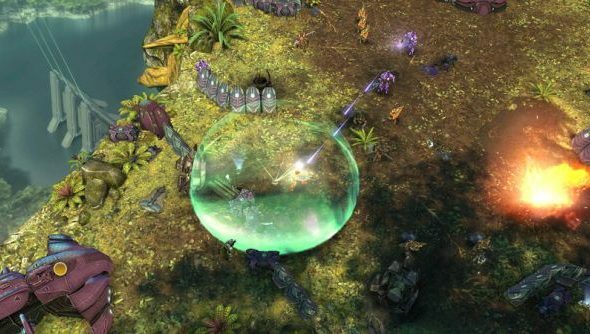 Halo: Spartan Strike is our sliver of that distant action: a twin-stick shooter semi-sequel to Spartan Assault. Here’s what it’ll look like. Spartan Strike is due out on December 12 for PC, tablets and smartphones. You can find it on Steam – but if you buy it for a smaller device it’ll appear on your desktop too. Vanguard Games and 343 Industries have tackled some of the specific issues our Tim had with “load of old gash” Halo: Spartan Assault – not just the controls, but also the missing warthog and promethean enemy types. Beyond that, they’ve gone one fan-servicing step further in setting the story during the events of Halo 2. But it’s still in isometric twin-stick shooter on a platformer which, historically, hasn’t really cared for them. And it’s still not Halo 5. Is that a problem for you?